This is not good work, but it was good to go back to simpler things, back before walling became overly competitive and extravagant and so ridiculously, maddeningly detailed that it became undesktop-able... no, okay, maybe that was just me putting too much crap in for the lulz. I was in this Purgato-- er, "in-between", shall we say, almost a year ago. First, congratulations on making it out of college alive ;). Just a tip, though : if you want to keep on painting and doing any other artistic hobby, do not stop! Reserve some time for this every week, or else when you've got a job, you'll probably never find the time. It's always a pleasure to see more of your art! What I like the most about this one is the visible strokes : they really give the impression of feathers. Thank you so much for sharing! First off, I'm extremely glad to see that you were able to survive your way through college. Perhaps once things start to settle down and you've got several job aspects sought after, maybe we could chat a bit more and catch up sometime. I have missed our crazy conversations full of awesome and Hobbits going to Isengard. One thing that's absurdly distinct about this piece is the difference in art style than what's demonstrated in the past. I don't know if this is in part due to your partner, but I actually rather like it. The style itself is slightly reminiscent of something-or-another from the Playstation 1 days, of which I cannot remember for the slightest right now but I absolutely adore it. It's probably one of the things I admired most about your work. You constantly strive to push boundaries and get better and better, and with just several hours of work you created something that shows not only a great distinction from what you've done before, but also chaotic beauty. So obviously I really like the whole art style, but what about the rest of the piece? Well, that's just as glorious as well. The barrage of darker colors mixed in with some primaries really gives it that extra pop. It really reminds of the whole grunge era, except on a whole different scale. Those feathers have sort of an ethereal beauty to them, and I completely dig that. I get the impression the character is some time of warrior or goddess/Valkyrie. However, it's that abstract style design to the left of the character that I absolutely adore. The placement, the amount of shade given to create depth, and the pattern of it really just fits the mood. It's like a battlefield and the aftermath is represented in a surreal manner. I'm probably going way beyond what the actual concept is, but that's the image it creates. So you think it's meh, and ok, but dear gosh does this blow my mind. First thing I see when I wake up in the morning, is this, and I know my whole week is going to rock my socks off. Absolutely stunning selection of colors and truly a sign that you know your way around a canvas. By far one of my favorite pieces from you for so many reasons. I'm so glad to see you're back with your wonderful works! This is gorgeous as always! 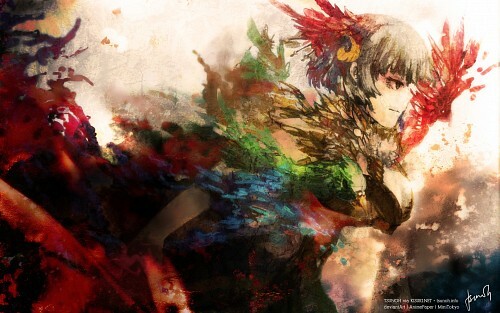 I really like the style and the colours, that bird you painted with green-blue-red is really eye-catching. Your composition are always amazing and there's an atmosphere kind of an epic movie! I love the textures and colors, and that there are some obvious figures, yet it's loose and chaotic enough that you're not entirely sure what you're looking at. I particularly admire the post impressionistic look. The colors are vibrant and the composition is phenomenal also. The dramatic play of dark and light is what pushes this work over the border into the Elite category in my opinion. You definitely have a creative style and a flair for the exceptional. You have my appreciation indeed for this most excellent work. so nice! I like this style of painting.